Ch. 5 - A Living Sacrifice of Love - My Catholic Life! It’s tempting to think that if you make the radical decision to become holy, your life will be much easier. In some ways that’s true. However, holiness and suffering are not mutually exclusive. In other words, committing yourself to holiness does not mean that your life will be freed from suffering. But it does mean that your suffering will be transformed. Think about the life of Jesus Himself. He was perfect. However, He also suffered to the greatest degree. Suffering is not a sign of God’s disfavor; rather, it’s a normal part of radical Christian living within a fallen world. Therefore, suffering even affected the Son of God to a profound degree. 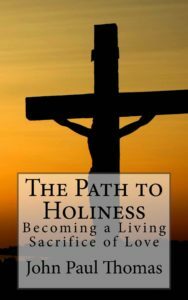 One perspective we can take is to say that the “path” to holiness is made up of these three virtues but that “holiness” itself is fully arrived at only when those virtues are manifested within the daily sufferings you endure, embrace and unite to the transforming power of the Cross. The result of embracing these three virtues within the context of your daily crosses is what can be termed “sacrificial living” or “redemptive suffering.” This chapter will look at the ways in which someone who is living humility, trust and mercy will approach suffering in such a way that their suffering becomes redemptive and imbued with sacred power. Though these are deep concepts, they are real and are essential to understand so as to live them as you encounter the normal sufferings of life. Why Would a Loving God Allow Us to Suffer? If this basic logic holds up, then we have a problem. We know that there suffering in the world and that even the innocent suffer greatly at times. So what shall we conclude? Does this mean that God is not all-loving and/or not all-powerful? Certainly not! God’s “answer” to suffering was not to eliminate it in a simplistic way; rather, He did something far greater. He transformed suffering and enabled it to become sacrificial, thus “eliminating” it by transforming it. Therefore, every form of suffering we endure now has the potential to become an instrument of grace. And this is glorious! Only God could do something so miraculous and unfathomable! When God created us, He created us with free will. And with our free will we are capable of either choosing love or choosing sin. That is what free will is for. We can love or hate, become merciful or harsh, be virtuous or a sinner. It’s important to understand that if God were to eliminate suffering in a simplistic way, He would also have to eliminate our free will. Why? Because our free will is ultimately the source of suffering in this world when we choose to sin. However, it is also an instrument of much human fulfillment when we choose to love. So if God eliminated our free will, He would also eliminate our ability to love Him and others freely. But let’s ask this question in another way: Could God eliminate suffering leave us with our free will? The one thing God cannot do is contradict Himself and violate His own laws. Though He can “violate” some non-moral laws He has created (such as when He performs a physical miracle by suspending the laws of nature), He normally does not do so simply because we want Him to. By analogy, it would be like saying that an all-powerful and all-loving God should not want you to be burned if you put your hand in fire. Therefore, you should be able to pray to God for protection and then put your hand in fire and God should protect you from pain. But that’s foolishness! Though God could do such a thing, He does not do it simply because we pray for Him to do so. Putting your hand in fire has consequences and God will not change that. So it is with sin and the moral law. Sin has consequences and God will not change that. However, He does offer to transform the consequences! And this is what happens when suffering is transformed by our choice to turn it into a sacrifice of love. How comfortable are you with the idea of sacrifice? For many, this word evokes both concern and admiration. When we see someone acting in a sacrificial way, going to great lengths to give of themselves for the good of others, we are easily inspired. However, when we are put into a position to act sacrificially toward another, especially when this involves some form of personal suffering, there is often hesitancy and uneasiness experienced in making the choice. Sacrifice is noble and easily understood to be of great value. However, it’s much easier to admire sacrifice from a distance than it is to actually participate in the sacrifice itself. Too often, all we see is the suffering that is involved. For example, let’s say there is a hostage situation in which a group of terrorists are holding you and others for ransom or for some other purpose. As part of the “negotiation” with the authorities they decide to kill someone to illustrate how serious they are about their intent. They look at the group of you and ask if anyone wants to volunteer to be killed so as to keep the others from facing that fate. Would you step forward? Of course, from a distance, the one who does step forward would win the deep admiration of others as a martyr. But when you are faced with such a sacrifice, it’s not as easy to make as it is to admire from a distance. Making the choice to sacrifice yourself out of love is no easy choice when it involves great suffering on your part. So that brings up a related question: How comfortable are you with suffering? Most will immediately respond negatively to this question. Why would anyone want to suffer? Suffering and sacrifice are different from each other but are related. Suffering is of no value unless it becomes sacrificial. As an illustration, consider again the example just mentioned of a hostage situation and imagine that one of the terrorists is shot by the authorities. This inflicts much suffering upon him but that suffering is of no value, whereas the death of a martyr is of great value. Why? Because in the case of the terrorist getting shot, the suffering is experienced as a just consequence of his actions. However, in the case of the martyr, the suffering is experienced as a sacrifice. Therefore, only that suffering which is freely embraced as a sacrifice is transformed and has great value. The sacrifices of martyrs as well as all sacrifices we make in our daily lives have value only because they are able to participate in the one and perfect Sacrifice of the Cross of Christ. His is the greatest sacrifice ever known in this world. He was the Innocent Lamb who suffered willingly for sinners. He was the Martyr of all martyrs. He suffered greatly but did not hesitate in embracing His suffering in a sacrificial way. The effects of His freely embraced Sacrifice of Love was the salvation of the world. Thus, His Sacrifice bore the greatest amount of good fruit. If we want to share in the glorious life of Christ, we must also allow our sufferings to share in His Sacrifice. In his letter to the Colossians, St. Paul wrote, “Now I rejoice in my sufferings for your sake, and in my flesh I am filling up what is lacking in the afflictions of Christ on behalf of his body, which is the church…” (Colossians 1:24). This is a deeply profound and mysterious statement. How can anything be lacking in the afflictions of Christ? However, it’s important to note that St. Paul did not say that there was anything lacking in the “sacrifice” of Christ. Rather, what was lacking was only associated with Christ’s “afflictions” (His sufferings). The “sufferings” of Christ are sufferings. And although suffering itself has now been redeemed and imbued with the potential of the salvific power of the Cross, each one of us still must unite our suffering to that Sacrifice. What’s “lacking” in the sufferings of Christ is the redemption and transformation of sufferings in our present historical moment. We allow our sufferings to be transformed here and now by willingly uniting our sufferings with those of Christ’s. We are invited to become members of Christ’s body and in so doing we are invited to allow the sufferings we endure in life to become redemptive. “Redemptive suffering” is suffering transformed by the Sacrifice of Christ. It’s our way of becoming a continual outpouring of the mercy of God by becoming a continual presence of the Sacrifice of Christ in our world. Though the Sacrifice of the Cross is eternal, transcending all time and space, it becomes present here and now in our world when we allow His Sacrifice to manifest itself in our daily crosses. Thus, our daily choices to sacrificially embrace suffering and unite it to the Cross have the effect of perpetuating the Cross of Christ in time and space, making that one perfect Sacrifice present in every day and age and in the here and now. When the Cross of Christ transforms our daily sufferings, the “lacking” dissipates as His one Sacrifice is made manifest. Therefore, we can say that it is our high calling to daily “incarnate” the Sacrifice of Christ by embracing every suffering with humility, trust and mercy. As true “sacrificial living” is embraced within the concrete experiences of your daily life, it must then be embraced day after day. Sacrificial living must become a habit by which you are neither scandalized by the crosses you encounter each day nor lose faith because of them. Sacrificial living in your daily life has the potential to ultimately transform the “burden” of the cross into the “sweetness” of God’s merciful love, enabling you to remain humble, trusting and merciful in all things and at all times. The Apostle Luke writes in his Gospel that Jesus said to all, “If anyone wishes to come after me, he must deny himself and take up his cross daily and follow me” (Luke 9:23). But do you know what your daily cross is? Do you understand why you suffer daily? Before you can properly offer it as a sacrifice, you may find it beneficial to consider the following three primary sources of suffering: 1) original sin; 2) personal sins committed against you; 3) personal sins you commit yourself. All suffering in life will fall into one of these three categories. By understanding the sufferings you will encounter from these three sources, you will more easily be able to unite those daily encounters to the Cross to experience the high calling of daily sacrificial living. Is it natural for humans to sin, experience illness, fatigue, confusion, anger and eventually experience death? Most likely you would answer “Yes” to this seemingly depressing question. However, none of these are “natural” to humanity strictly speaking. But they are now part of our fallen human nature. From the beginning, God created human nature in such a way that there was perfect order within us. Our minds were clear, our emotions were balanced, our passions were under control, and our bodies did not experience sickness or death. The rest of the natural world was the same way. Disease, disorder, and death were not present in the original paradise of the natural world created by God. However, once the freely chosen sin of disobedience took place by our first parents, the natural world and human nature itself suffered the effects of this original sin on account of the separation from God that was experienced by that sin. It is important to understand this distinction between nature, as it was originally created by God, and fallen nature, as it is now experienced after sin. God created us and the world in perfection. But neither we, nor the world we live in, are in that original state of perfection any longer. The natural world is now filled with disorder (e.g., disease and death). We now suffer all the physical, psychological and emotional effects of a fallen world. We also suffer all the spiritual effects of fallen human nature. The spiritual effects are what we call “concupiscence.” Concupiscence is the unnatural draw we feel toward sin. We experience temptation and a tendency to act in a selfish way. Our first parents did not experience this tendency in the state of Original Innocence, which makes their original choice to sin (Original Sin) quite grave. They made a completely free choice to turn from God. As a result, all of creation fell into disarray. Regarding the spiritual effects of the fall, we, the descendants of Adam and Eve, now find it difficult not to sin. We experience much internal turmoil and confusion and, as a result, often sin ourselves. Recall, again, the words of St. Paul quoted in Chapter Two, “So, then, I discover the principle that when I want to do right, evil is at hand. For I take delight in the law of God, in my inner self, but I see in my members another principle at war with the law of my mind, taking me captive to the law of sin that dwells in my members” (Romans 7:21-23). St. Paul speaks in this passage of his interior experience of concupiscence. This internal struggle within his fallen human nature is an affliction stemming from original sin. It is also an experience we all have on a daily basis. Reflect, also, upon the very real struggle you have with disordered and confused thinking. Our minds are not able to make sense of life without grace. This mental struggle we all experience is also because of our fallen human nature and brings with it human suffering in the form of mental anguish, anxiety, emotional distress and the like. Physical suffering is also a result of our fallen nature. Take, for example, the painful experience of a serious illness. In the state of Original Innocence, our first parents did not suffer any bodily disease and the suffering that results from it. Suffering and death were not the original intent of God in His design of humanity. We were originally created to live eternally. The practical question is this: How do you embrace these forms of suffering that have resulted from fallen human nature and are clearly unavoidable so as to allow God to transform them? Though the answer is simple in its explanation, it is not easy to live until a strong habit of sacrificial living is formed. Therefore, the answer to this question is to return to the three virtues of humility, trust and mercy and seek to keep them alive in your life in the midst of anything you endure. These virtues will enable you to do more than eliminate these forms of sufferings from your life. They will enable you to “eliminate” these sufferings by healing and elevating the root cause. These virtues will clarify your thinking, strengthen your will and enable you to make the daily choice to embrace the effects of sin in a sacrificial way. For example, let’s say you encounter a serious illness which ultimately will result in death. The illness inflicts upon you several months of suffering. What are you to do? Some will become consumed in anger, self-pity and despair. Some will seek a quicker way out through euthanasia. Others, though, will embrace every suffering that this illness inflicts, humble themselves day after day, entrust themselves to God more fully than ever before, and turn their eyes to loved ones to comfort them and shed mercy upon them. Though despair, anger and self-pity are understandable to one degree or another, it must be understood that they are not the ideal to achieve. The ideal is to allow the suffering you endure to perfect the virtues of humility, trust and mercy in your life in such a way that your suffering is transformed and much grace flows from your life as a result. The holy embrace of suffering and death, in this case, produces an abundance of good fruit in your life and in the lives of those who love you. The rejection of suffering, in this case, will result in more suffering. This is much easier to speak about than to live. However, if you seek to live humility, trust and mercy throughout your life, especially when you encounter a serious suffering in your life, it will be much easier to continue down the road of virtue and freedom. Those habits you have formed will elevate your new and intense suffering to the level of redemptive suffering as it becomes an act of sacrificial love. As a result, much grace will flow through you into the lives of those whom you encounter every day. Suffering can also occur as a result of the sins of other people. Some sins can directly involve you with the purposeful intent of bringing suffering to your life, while other sins can indirectly involve you but still bring you suffering as an unintended consequence. One example of the latter (suffering as an unintended consequence) could be the implementation of an unjust law. An unjust law originates in the mind and free will choice of a legislator and, thus, is ultimately the result of someone’s personal sin (or perhaps the sin of several people). Over time, if that law causes you some undue injury, you are suffering because of the other’s sin. Other examples of suffering indirectly caused by the sins of another are as follows: 1) A drunk driver causes an accident and does you harm; 2) A financial advisor is negligent in the care of a company’s retirement plan and you lose much of your own savings; 3) Your spouse breaks the law and is sent to jail causing much hurt to your whole family. Of course, there are many other scenarios in which sins of others unintentionally cause others harm. Sadly, sometimes the sins of others are purposefully directed toward you with the direct intent of doing you harm. For example, let’s say you lose your job on account of the hatred of your boss. He is an unhappy man who dislikes you for no reason. As a result, he decides to inflict this suffering upon you by firing you and causing much hurt in your life and that of your family. By experiencing such an abuse, you have a choice to make. Either you will lash out in hatred and a desire for vengeance, or you will allow the suffering imposed upon you to “make up” what is “lacking” in the sufferings of Christ. It’s important to note that your choice to unite this suffering to the Cross of Christ is not the same as saying the abuse is OK. On the contrary, by uniting it to the Cross you are acknowledging it as an unjust persecution. But when you choose to face this injustice with mercy and forgiveness and keep your eyes on the will of God, you rob the injustice done to you of its power. Furthermore, you allow this injustice, caused by the sin of your boss, to be changed. The evil is now a source of grace and mercy in our world on account of your choice to invite grace and mercy into that painful situation. By this act, you make present, in time and space, the sacrificial love of Christ Himself. Some other obvious examples of direct sins against you would be: 1) Someone steals from you; 2) Someone verbally or physically harms you out of anger or malice; 3) Someone lies about you with the intent to do damage to your good name. In these cases, the pain inflicted will tempt most people to turn away from the virtues of humility, trust and mercy. The immediate reaction to these unjust injuries may be anger. And although anger is understandable, you need to be careful not to sulk in this injury or to turn to hatred or despair. Refer back to Chapter Four in this book regarding the mercy you are called to offer others when they sin against you. The purpose of this chapter and this reflection is to help you reflect upon how sins committed against you can also become transformed into sacrificial love. It is not easy to refrain from anger in cases where the sins of others harm you, unless you have deeply formed the habits of humility, trust and mercy. But when these habits transform the unjust suffering you endure, that injury will be robbed of its power to weigh you down. This will be the case even if the person who sinned against you does not repent. Nonetheless, you will remain free to love and “rejoice” in life and stay on the path to holiness, regardless of anything you suffer unjustly. Thus, in this high calling of sacrificial love, the unjust suffering you endure actually produces more good fruit in the world than if you were never sinned against in the first place. This reveals that God’s will is not ultimately robbed of it’s power by the sins of others when His saints allow that sin to be transformed in their lives. The worst form of suffering you can endure in this life is the suffering you bring upon yourself because of the personal sins you commit. This suffering is always painful because sin has the direct effect of separating you from God, the source of all joy and fulfillment. When you fail to repent of your sin, your sin is of no value and continues to inflict upon you deep personal suffering. However, when you do repent, even the suffering that your sin inflicts upon you can be transformed into grace because of the mercy of God. However, the suffering that results from your personal sins cannot be transformed into sacrificial living until you repent of your sins and you are reconciled with God. If your sin is committed toward another, there must be repentance before the sin you committed can be transformed and elevated to the level of sacrificial living. As an example, imagine that you struggle with anger and you allow that anger to fester and grow until it manifests itself in such a serious way that you do great damage to the ones you love. When the sin of anger is directed at your loved ones, especially when this happens in a habitual way, you do great damage to those relationships. Though your relationships will suffer because of your sin, the most serious harm you do is to yourself. That’s not pointed out to lessen the concern about the harm you inflict upon others; rather, it’s pointed out to make it clear that sin is irrational even from a selfish point of view because of the damage it does to your own soul. The good news is that if you are able to sincerely repent, express that sorrow, and authentically change your life, God can do great things with the past hurt. It is even more glorious when your sorrow is expressed, is subsequently received and the anger is replaced by a new and habitual virtue of mercy toward those whom you have hurt. When this happens, God cannot only heal old wounds, He can even transform those wounds into new sources of love. This is especially due to the fact that the forgiveness of past wounds requires a tremendous amount of mercy on your part and on the part of the person you have hurt. However, if that mercy is mutually exchanged, the new depth of mercy shared, because of the past sins, is truly sacrificial and elevates the relationship to newfound levels of love. The same is true in your relationship with God. Though sin is never desirable, it’s consoling to know that, when you fall, if you get back up, repent and truly change, you will be stronger and will love God with a new depth. Sin itself, and the suffering it inflicts, can and must be transformed. When the sins you commit have long-term effects (for example, resulting in a prison sentence, a civil divorce, the permanent loss of a friendship, etc. ), God invites you not to brew over that hurt, remaining in sorrow and shame. Instead, He invites you to daily unite that ongoing suffering to Him and His Cross. In this case, the ongoing suffering has the effect of becoming an ongoing source of sacrifice and, therefore, an ongoing act of humility, trust and mercy in your life. It needs to be pointed out that there is also another form of interior suffering that sometimes affects those striving for holiness. This is the spiritual suffering of interior darkness. Recall Jesus’ words on the Cross, “My God, my God, why have you forsaken me?” (Matthew 27:46b). While on the Cross, Jesus experienced a deep inner darkness and a human experience of separation from the Father. As a result, He cried out, praying Psalm 22. When you read that entire Psalm, it is clear that the conclusion to that prayer is one of faith in the midst of apparent abandonment from God. By embracing this human experience, which brought with it extreme interior suffering, Jesus perfected human nature in the area of faith, allowing us to know, with deep conviction, that God never abandons us. At times, God will remain silent to certain people who seek Him. Of course, He is always there and would never leave them. Yet, He remains silent, inflicting a deep suffering on the individuals because of His perceived absence, to give them the opportunity to perfect their faith. In those moments, they are invited to remain humble, exchanging all their personal fears and selfish desires for what God knows is best for them. The goal is to deepen the personal trust in God in a way that could never happen if His consoling presence were continually “felt.” It gives the opportunity to receive His mercy in the purest and fullest amount, and to unite human sufferings to the one Sacrifice of Christ. of His grace in the world. You should not be too concerned about this, however, since God knows what you need when you need it. And this form of suffering will only be offered when it is of direct benefit to the sanctification of your soul and the souls of others. This profound mystery of the spiritual life in which God purifies our souls by inflicting a spiritual wound of love is exactly that: a profound mystery. Nonetheless, it is helpful to at least understand that St. John of the Cross, St. Mother Teresa of Calcutta, as well as numerous other saints, have written on this experience in an exceptionally deep way. In the Diary of Divine Mercy, written by Saint Faustina, Jesus revealed to her a unique vocation to suffering and the power contained in its free embrace. She was invited to become a “sacrifice of living love.” Though this spiritual conference may be shocking at first, read it carefully and be open to the deep power of its message. The rest of this chapter will be spent reflecting upon this high calling of love in detail. My daughter, I want to instruct you on how you are to rescue souls through sacrifice and prayer. You will save more souls through prayer and suffering than will a missionary through his teachings and sermons alone. I want to see you as a sacrifice of living love, which only then carries weight before Me. You must be annihilated, destroyed, living as if you were dead in the most secret depths of your being. You must be destroyed in that secret depth where the human eye has never penetrated; then will I find in you a pleasing sacrifice, a holocaust full of sweetness and fragrance. And great will be your power for whomever you intercede. Outwardly, your sacrifice must look like this: silent, hidden, permeated with love, imbued with prayer. I demand, My daughter, that your sacrifice be pure and full of humility, that I may find pleasure in it. I will not spare my grace, that you may be able to fulfill what I demand of you. There are two primary lessons we need to take from this passage above. The first lesson is that God calls some people to a unique life of sacrifice and prayer. Saint Faustina, a cloistered nun, was one of those people. She was not given this vocation simply because she was a cloistered nun; rather, she was chosen by God for a unique life of suffering, sacrifice and prayer for reasons only known to God because of His mysterious yet perfect will. Saint Faustina lived in a cloister, spent many years with serious illness, was ridiculed by many of her sisters, and from the perspective of the world was more of a burden to society than she was productive. From a worldly point of view, what good did she do in this life? How was it that living hidden away in a cloister benefitted anyone. And the fact that she was continually in ill health and was disliked by many sisters makes one wonder if she added more to the well-being of the cloister or to its demise. “You will save more souls through prayer and suffering than will a missionary through his teachings and sermons alone. I want to see you as a sacrifice of living love, which only then carries weight before Me. You must be annihilated, destroyed, living as if you were dead in the most secret depths of your being….then will I find in you a pleasing sacrifice, a holocaust full of sweetness and fragrance. And great will be your power for whomever you intercede. If you can accept and believe these words from our Lord, then it must be believed that the effect Saint Faustina had on the lives of many was extraordinary. Even if we separate out the fact that her Diary is now published and many benefit from the spiritual lessons it contains, the message that Jesus speaks is that the power contained within her hidden, silent embrace of suffering saved countless souls without her even fully comprehending it. Saint Faustina became a “sacrifice of living love” and, as a result, God opened the floodgates of mercy, imbuing her prayers with great spiritual power for whomever she would intercede. Imagine her joy in Heaven as she comes face to face with the countless souls who were saved by the hidden sacrifice she lived. This is a mysterious yet glorious vocation that has as its center the mission to suffer and to unite that suffering to the Cross of Christ. This is so that the “pleasing sacrifice” of the Son of God on the Cross is perpetuated in time and space and becomes a continuous source of grace in the life of the one given this vocation. Not many are given this mysterious vocation to suffering and sacrifice, but some are, and only in Heaven will we see the power of the hidden sacrifice that they make. the unique vocation of Saint Faustina to one extent or another. Though some are uniquely called to embrace sacrificial love in a profound and sustained way, everyone is called to be a “living sacrifice of love” in accord with their own unique vocation. And what’s most important to remember is that the spiritual power that flows from this free embrace is far greater than we will ever know in this world. Practically speaking, your daily life offers countless opportunities to live out your unique vocation to sacrificial love. To discover what those opportunities are, begin by reflecting upon that which you complain about the most. What is it that bothers you the most, angers you, causes you anxiety or tempts you to despair? Whatever comes to mind is the first place to begin your unique vocation to sacrificial living. Allow the power of the Sacrifice of Christ’s Cross to transform the “burdens” into funnels of grace and mercy for the world. Know that these perceived burdens are ultimately what will enable you, like Saint Faustina, to have great spiritual power of intercession for a world in need. Do not waste that power on self-pity, anger, pride or passing consolations. If all of this talk about suffering and sacrifice has left you concerned, there is good news that will be quite consoling. Heaven awaits! In Heaven, there will be no more pain or suffering at all. In Heaven, all sacrifice in this life will be transformed into eternal blessings with which you will be rewarded. The rewards will be to eternally experience the fruit of your sacrifice and to rejoice in it to the greatest degree. In Heaven, you will never regret the choice you made to seek humility, to trust in God, to offer mercy and to live sacrificially. Every burden that you freely embrace here and now and unite to the Cross will be a beacon of light shining brightly from your soul in splendor and beauty forever. In Heaven, you will realizethat every sacrifice was worth it and the gratitude you experience will be abundant. But there is even more good news. When you embrace a life of sacrificial living here and now, and when you fully embrace every cross, God will often bestow upon you what we may call “the sweetness of sacrifice” here and now. Recall the earlier quoted poem of St. John of the Cross when he called God’s purifying action “O sweet cautery, O delightful wound!” This “sweetness” and “delight” applies to all forms of suffering when it is transformed into a sacrifice of love. Yes, the suffering you feel may still hurt, the sorrow may still be deep, the sacrifice will still be required, but your full embrace of suffering will enable you to delight in the Cross of Christ as you are carrying that Cross. Jesus’ yoke is never heavy and His burden is always light when we embrace His yoke and His burden in our lives with full knowledge and complete consent of our will. In this case, our desires, passions and feelings will eventually be transformed and we will find great consolation in the Cross of Christ. At first, those desires, feelings and passions will remain in confusion and in opposition to the will of God. But the more completely we understand and choose the Cross, the more that every part of our being will line up and experience the spiritual fruit of our sacrifice united to Christ’s. Jesus “learned obedience from what he suffered” only in the sense that His free embrace of suffering, in human form, perfected human nature and made it possible for us to do the same by becoming “the source of eternal salvation for all who obey him.” We can be assured that as Jesus perfected human nature through His obedience to the will of the Father, as He freely embraced the suffering caused by the sins of the world, His human nature also rejoiced with an infinite amount of joy. So it is with us. If we want to “eliminate” the sting of suffering in our lives, we must embrace it. And though, at times, God will still inflict upon us the spiritual suffering of interior darkness mentioned earlier, we will come to discover that this darkness is a blessing and is producing great things in our lives and in the world. We will also be assured that if we persevere in our prayer, as Psalm 22 leads us to pray, the result will be the greatest spiritual delight that will begin here and now and continue for eternity. Reflect, today, upon the words and the heart of our Blessed Mother. Speak these words in your own prayer today. Say them within the context of whatever you are going through in life. Let them become a daily source of your faith and hope in God. Proclaim the greatness of the Lord, rejoice in God your Savior, and know that God’s blessings are abundant every day no matter what you experience in life. When life is consoling, see the blessing in it. When life is painful, see the blessing in it. Allow the witness ofthe Mother of God to inspire you each and every day of your life. g of praise in my own life. Help me to see God’s blessings in every aspect of life. Draw me into your own gaze of love to see the glory of the sacrifice of your own beloved Son.